Exablox is reimagining storage with OneBlox, the industry’s first scale-out object-based appliance that is accessible with Server Message Block (SMB) and Common Internet File System (CIFS) network protocols for organizations of all sizes. Instead of attempting to retrofit the solution into a legacy scale-up architecture, OneBlox employs a scale-out architecture and introduces the concept of a ring, a number of OneBlox appliances or nodes presenting a single global file system. 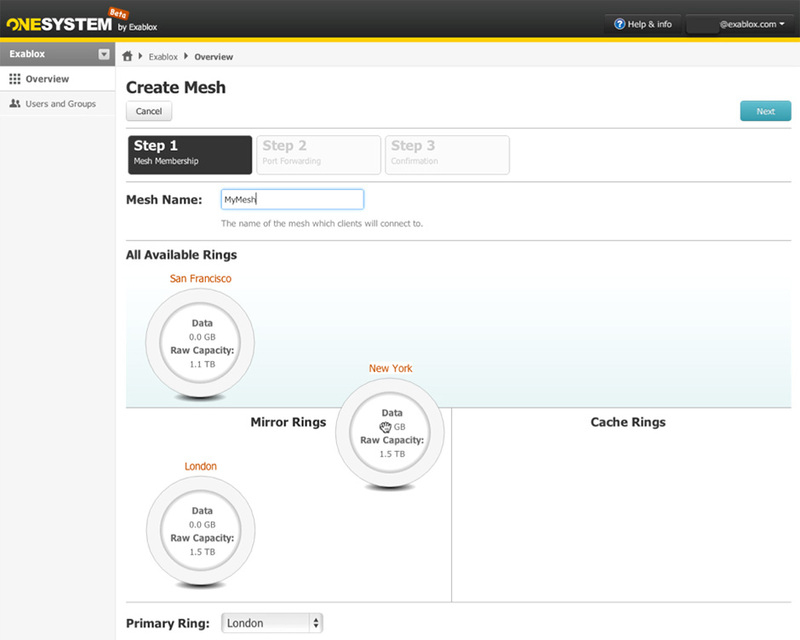 A ring may consist of one or multiple OneBlox, scaling from a few TBs to nearly 200TBs. The OneBlox architecture enables organizations to start with a single node and add additional OneBlox that join the ring automatically and non-disruptively--supporting the growth of your business. Eliminate the need for dedicated servers to manage your storage. 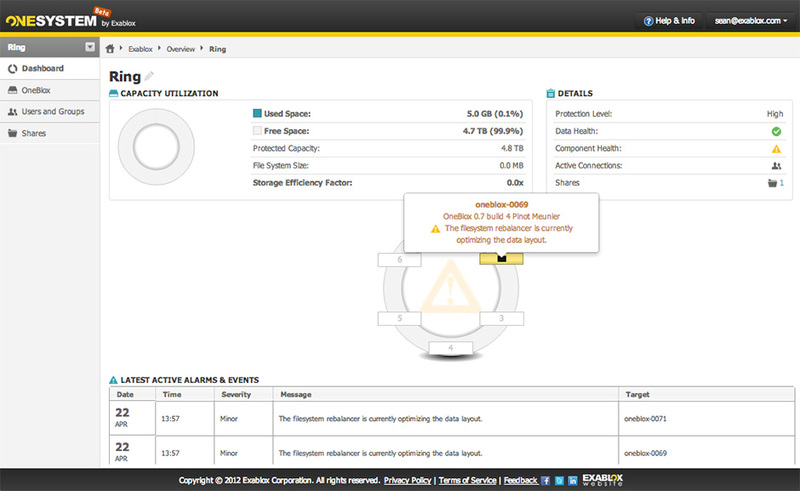 No more patching to keep the management software up to date. 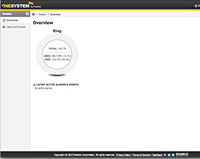 OneSystem is a secure cloud-based management service from Exablox that proactively monitors and manages OneBlox. Simply login and easily configure access permissions to your storage. 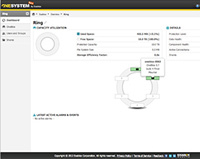 Whether you have responsibility for a single ring or multiple organizations with many rings, OneSystem’s administration capabilities empower you to manage the entire storage environment. Simply and securely. Bring your own drives. No RAID, no LUNs, no volumes. 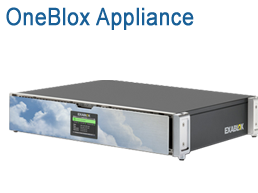 OneBlox delivers the flexibility for organizations to mix-and-match drive types (SATA, SAS, SSD) and capacity within the same OneBlox and within a ring. Use exactly the capacity your organization needs from the beginning and then add any drive at any time and OneBlox automatically pools the storage within the same global file system. No disruption to applications or users. No configuration settings to complete. No mouse clicks. No command line entries. No storage PhD required. Combined with OneBlox’s powerful inline deduplication, storage waste is minimized and organizations are able to maximize primary storage utilization. OneBlox can be installed and available to users in less than five minutes with zero configuration. Simply insert at least three drives, plug in Ethernet, power, and turn it on. It’s that easy. Need to add more storage? 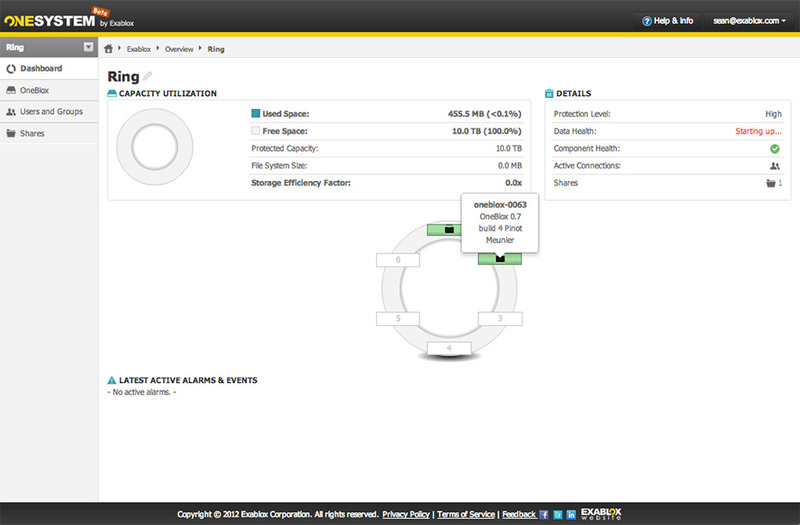 Simply add drives and the capacity is added to the same global namespace. 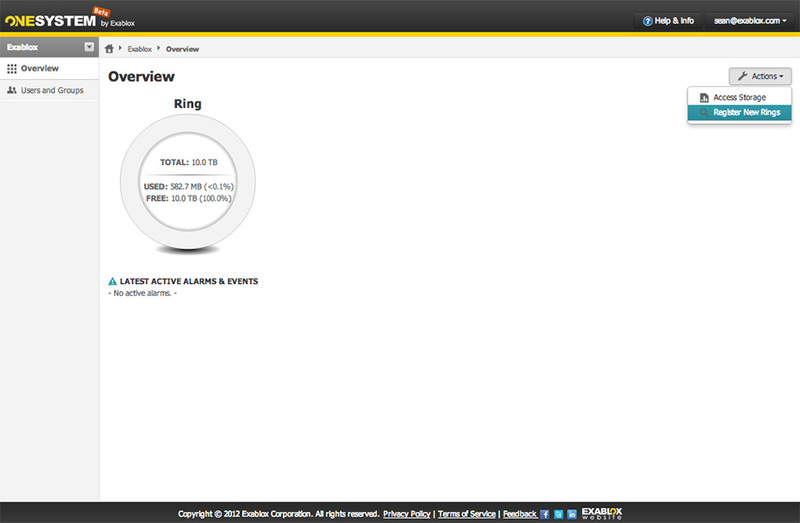 Need to add availability or performance? With no interruption to applications or users, additional OneBlox nodes can be added and automatically configured, enabling organizations non-disruptive scalability with their business. OneBlox’s always-on continuous data protection and encryption ensures that all of the information stored is fully protected. By taking a snapshot every time information is written to OneBlox, every file can be easily recovered in the event of data corruption, deletion, or other errors. 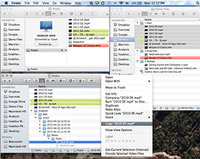 In fact, end users can recover their own information, simply by navigating through Mac Finder or Windows Explorer. 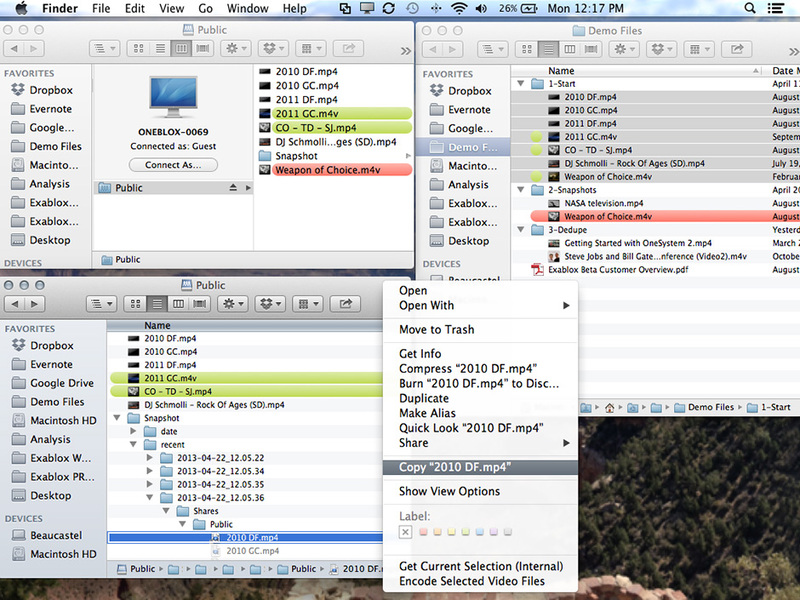 No need to restore last night’s backup tape, simply navigate and recover. Additionally, OneBlox protects against data loss by encrypting the data on each drive, making data theft from lost or stolen drives a thing of the past. 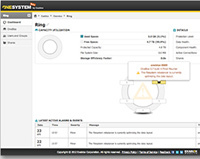 With its real-time replication, information stored in a OneBlox ring is fully protected. By avoiding legacy RAID technologies, OneBlox is able to transparently replicate and redistribute the data across multiple drives and nodes to protect against two drive or node failures. Additionally, with its advanced architecture, information is always protected across failure domains: drives, nodes, and an entire ring--even over wide-area distances. OneBlox is a reimagined scale-out storage solution that any organization can afford. Exablox's cloud managed, scale-out, object-based storage appliance solves businesses' common storage pain points. In this video you'll see what to expect when you first receive OneBlox, how to begin using OneBlox, and how to begin managing OneBlox with OneSystem. 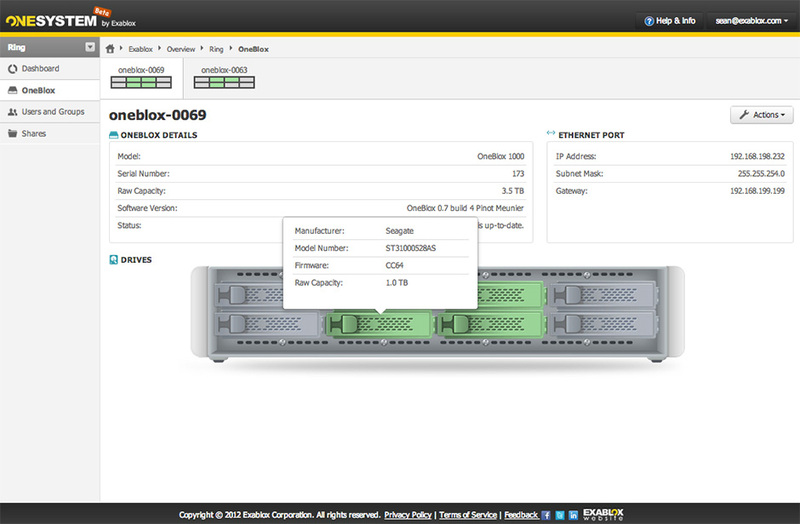 In this video you'll see how to add and remove storage from OneBlox. Our specialists are expert in designing network attached storage solutions and can help you create a plan for sourcing and deploying your ExaBlox solution. 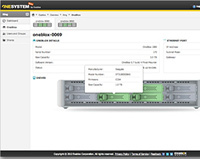 Optrics offers personalized ExaBlox stoage system training - a service designed to help you integrate your ExaBlox solution smoothly into your network infrastructure.